Choosing the right type of IQF freezer to invest in, for a production line, is most of the times a challenge for food processors, both in terms of the quality of the end product and also in consideration to the costs, in total, for running the equipment. Usually, the efficiency of the freezer is considered to be related to the fans and the total motor power, but the facts actually show us there is more than that to keep in mind while considering the energy efficiency of a tunnel freezer. What influences energy efficiency in an IQF tunnel freezer? The important elements that influence energy efficiency in an IQF tunnel freezer are: aerodynamics, the fans, the bedplate/ conveyor belt, the coil design as well as the housing and floor heating. The aerodynamics of an IQF freezer are affected by several elements and parameters and represents a complex balance between freezer design, fan speed, pressure and temperature. 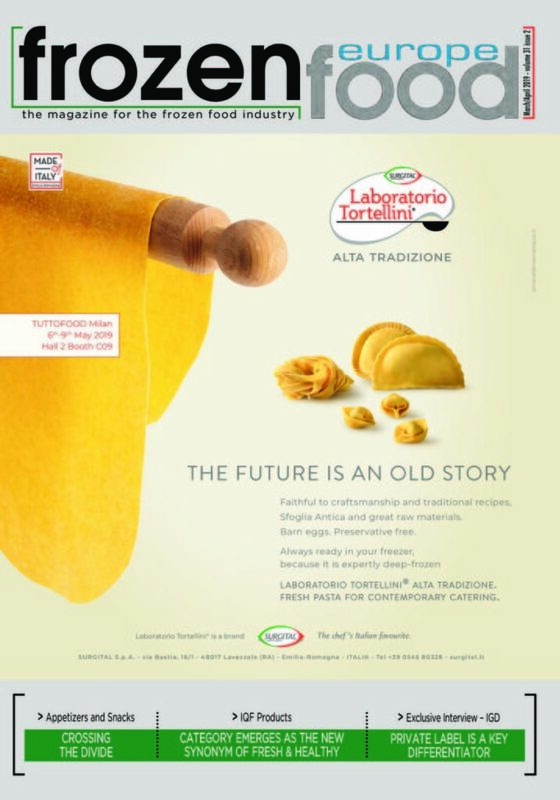 The right aerodynamics will determine the quality of the end freezing result, the dehydration rate of the product and of course the overall energy efficiency of the freezer. The OctoFrost™ IQF tunnel freezer does a great job at joggling all of this by using a complex equation of the right pressure, air velocity, temperature, design of the freezer and fans. The size of the OctoFrost™ IQF freezer, the smaller than any other freezer on the market with the same capacity, is possible only because of the effective aerodynamics. In general, an IQF tunnel freezer runs the fans at full capacity in order to achieve a good freezing result, but this means high energy consumption and unnecessary overblow of the product. 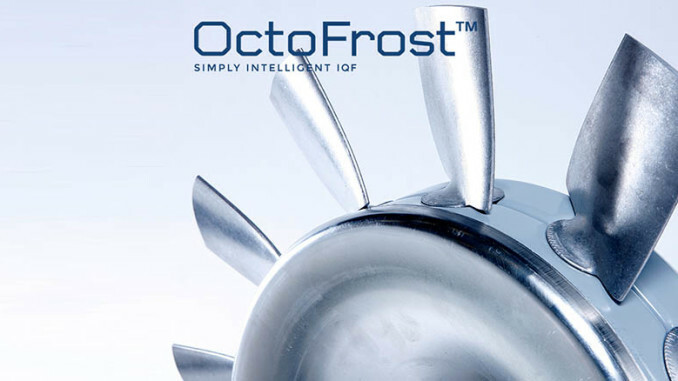 The OctoFrost™ uses vane axial fans instead, which can run at different speeds – a highly important feature for food processors because they can adjust the fans speed according to the product they are freezing. 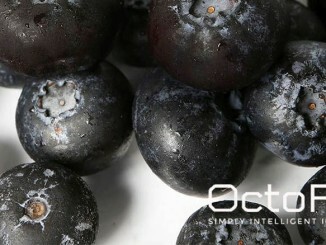 This way the OctoFrost™ doesn’t need to run more than 75% – 85% fan speed. Also, the design of the OctoFrost™ fans is custom-made for the OctoFrost™ IQF freezer with 5 major parts leading to better air control and energy efficiency. Traditional IQF freezers will use a conveyor belt, but the design of the belt will bring a minus in terms of energy efficiency for the tunnel. 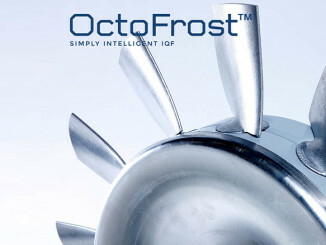 The main reason why the OctoFrost™ fans don’t need to run over 75% – 85% is the OctoFrost™ bedplates. The configuration of the holes’ and the thickness of the plates, make it possible for the bedplates to achieve the desired fluidization type which will mean less energy consumption with improved freezing result. The size of the coil inside the freezer is very important in order to handle the heat transfer. OctoFrost™ freezer’s coil is oversized so it can allow the fans to run at lower speeds while the large front area will increase the time between defrost. Traditional IQF freezers need floor heating against the high temperatures, because otherwise the floor underneath the freezer will freeze, create cracks and eventually destroy the equipment. Heating the floor is the solution for traditional IQF freezers in order to avoid the risk of the floor freezing but it is also one of the highest expenses for IQF processors in terms of energy efficiency. The OctoFrost™ IQF tunnel freezer doesn’t require floor heating because the body of the freezer stands on its own supporting feet and the air can circulate under the freezer to avoid accumulation of cold in the floor. In addition, the walls of the freezer are insulated really well. The energy cost for IQF equipment is very important to look at when deciding for the right IQF tunnel freezer for a production line. What Types of Fans Are Used in IQF Technology?